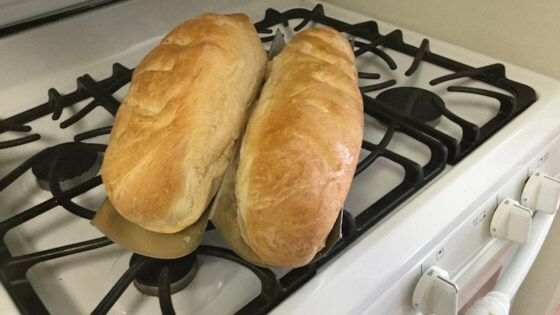 "A delicate texture makes this bread absolutely wonderful. I sometimes use the dough to make breadsticks, which I brush with melted butter and sprinkle with garlic powder." In a large mixing bowl, dissolve yeast in warm water. Add the sugar, oil, salt and 2 cups flour. Beat until blended. Stir in enough remaining flour to form a stiff dough. Turn onto a floured surface; knead until smooth and elastic, about 6-8 minutes. Place in a greased bowl, turning once to grease top. Cover and let rise in a warm place until doubled, about 1 hour. Punch dough down; return to bowl. Cover and let rise for 30 minutes. Punch dough down. Turn onto a lightly floured surface. Shape into a loaf 16 in. long x 2-1/2 in. wide with tapered ends. Sprinkle a greased baking sheet with cornmeal; place loaf on baking sheet. Cover and let rise until doubled, about 25 minutes. Beat egg white and cold water; brush over dough. With a sharp knife, make diagonal slashes 2 in. apart across top of loaf. Bake at 375 degrees F for 25-30 minutes or until golden brown. Remove from pan to a wire rack to cool. Excellent! Made a beautiful loaf. Followed recipe exactly, except I did not use the egg wash. Brushed with melted butter. Taste was perfection!